(Nanowerk News) The LICARA guidelines are geared towards small and medium-sized enterprises (SMEs) from all branches of industry, and help weigh up the pros and cons of nanomaterials and make decisions on their use. The guidelines also do their bit towards efficient communication in the value added chain. The use of nanomaterials can yield new or significantly improved product features. Industry would like to use the specific properties of nanomaterials for competitive products, but also avoid risks to humans and the environment. Many questions on the benefits and risks of nanomaterials are still open and the European legislation is challenging. 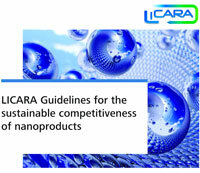 Empa issued a set of guidelines entitled LICARA as part of the EU project “LICARA” in conjunction with the Dutch research institution TNO, Nano-Cluster Bodensee and six other partners from European industry. Where and how can nanomaterials be useful? What are nanospecific hazards for humans and the environment? What legal framework is there? In addition to the guidelines, an Excel tool, the LICARA nanoSCAN, is available to illustrate benefit-risk trade-offs with nanomaterials semi-quantitatively. Back in 2011, Empa published the Nano Textiles guidelines on the safe access to and handling of nanotechnology in the textiles and clothing industry in conjunction with the textiles association Swiss Textiles.